The plastic attack was organized in effort to raise awareness about the global plastic problem and pressure big companies, like Loblaws to reduce its plastic packaging. Students from the University of Waterloo gathered at the Zehrs on 450 Erb Street West for a plastic attack protest on Mar. 11. The aim of this protest was to get Loblaws to eliminate plastic on at least 100 goods by December 2019 and financially encourage customers to use reusable bags or bring their own containers. As part of the protest, UW students went grocery shopping, unwrapped their goods, left the excess plastic at the checkout counter, and took their goods in reusable bags. The protest was organized by five UW students: Bryn McAuley, Kayleigh Swanson, Clare Urquhart, Katelyn Forsyth, and Ambika Opal. 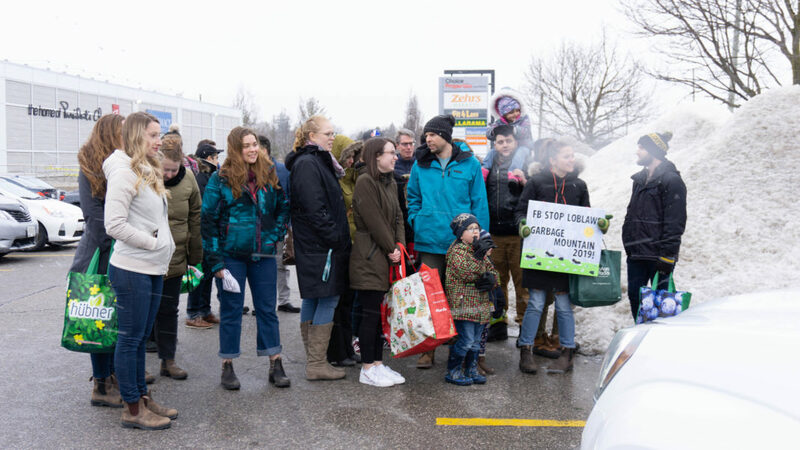 The protest was organized in response to a CBC story that revealed Loblaws has no plans of reducing its plastic packaging, while mainstream grocers in the U.K., like Iceland and Budgens, are taking big steps. “This is irresponsible corporate behaviour. We want Loblaws to join the 21st century and take dramatic action to reduce the waste they generate,” McAuley said. Students contacted Loblaws customer care, but were disappointed to find out that the company was least interested in taking measures to eliminate plastic, and instead attempting to make more products recyclable. “Essentially, we hope that this event will start a meaningful dialogue that leads to concrete actions on the part of the company. We also want to inspire other people around Canada and around the world to do the same protest. These protests started in the U.K. and there have now been at least a hundred of them across the globe. “You don’t even have to be organized in a group to do this, you can shop by yourself and leave your plastic packaging at customer service on your way out of the store. But be sure to explain to management why you’re doing it, and ensure they follow up with head office,” McAuley said. The organizers urged the protesters to remember that plastic use is not the fault of the workers or managers. The blame is on Loblaws companies and Galen Weston, executive chairman of Loblaw Companies Limited.